We are in France for a few days visiting my Mum’s family. As we are visiting a few different places we are roadtripping in my BMW – our first proper road trip as a family of three! Our ferry left Portsmouth at 9:00 this morning, so we travelled down to the south coast yesterday. 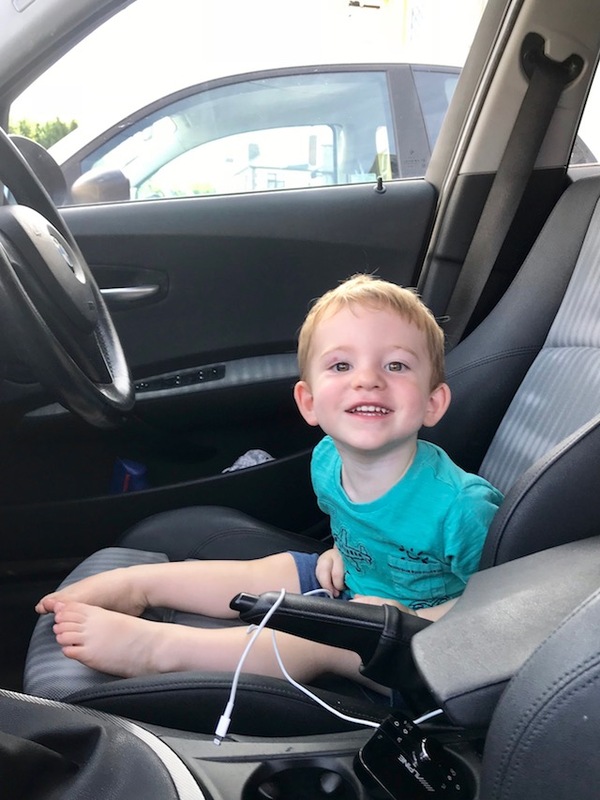 As I was loading the car Owen asked to sit in the drivers seat, it is one of the few places where he can sit still for ages, so I took advantage. The only problem was that he thought he was going to be driving us down the motorway. He was absolutely gutted when eventually removed him and strapped him into his car seat. He had a proper tired two year old tantrum. Luckily within a few minutes of setting off we saw a tractor, which cheered him up. Then before we even got to the city centre he was asleep! The journey south was uneventful, we called in at Itchen Valley Country Park in Eastleigh, to let Owen have a run around and stretch his legs. The drive took us two hours and Owen woke up just as we pulled into the park. Owen enjoyed both the playground and the play trail, which had animal themed play equipment dotted around in the woods. It also looked like there was a decent, albeit flat, bike trail, but there wasn’t room for my bike on this trip. Only a few minutes off the motorway it makes a much better stopping point than a service station! All the fresh air made us hungry, so we tackled the rush hour traffic and drove to Whiteley for dinner. It is a nice little out of town shopping/leisure area, which seemed to cater well for kids with animatronic dinosaurs and sand pits to play in. We ate at Bar + Block, a steakhouse which I think may be coming to Coventry soon. Jen and I enjoyed our steaks, but I’m not sure Owen was too fussed about his – he still has a lot to learn! In the morning we woke up early and called into McDonalds for breakfast on the way to catch the ferry, on the basis it would be cheaper and probably better than what was on offer on the ferry – we were right! Despite the early start, we only just got to the port in time. It has been well over ten years since I last caught a ferry from Portsmouth (I think it was 2005, when I first had my mk1 MX-5! ), but it seemed strangely familiar. Owen was very excited to get on the ferry, looking out of the window at all of the activity on the Solent and waving at the boats. The crossing wasn’t great, Jen and I don’t really have sea legs – I suppose that is because we live about as far away from the sea as you can get in the UK! Owen didn’t seem too bothered though, wanting to explore the ferry. It was funny watching him wobbling around as the boat pitched and rolled. We were definitely glad to dock at Cherbourg and that we will be coming home on the Chunnel! The first stop of our trip was a very small village called Gonfreville, where my Mum grew up, to visit her friend Christiane. Gonfreville is about an hour south of Cherbourg, slightly longer with a boulangerie stop for lunch. The French really know how do make a perfect ham and cheese baguette. Jen’s theory is that it is down to the butter, and Normandy butter is supposedly the best in the world. Owen slept the whole way, only waking up when he heard my Mum’s voice, as they had arrived at Christiane’s a few ays before us. The excitement of being on a farm, with rabbits and an excitable dog meant that Owen woke up quickly and was soon practicing his French, by saying “bonjour” to everything! We worked out it must have been seventeen or eighteen years since I was there, as I remembered Christiane’s granddaughter being about Owen’s age – she’s twenty now! My brother Simon and his wife Sophie also joined us, which made both Owen and Lola, the dog, even more excited. We had a drink, ate some cake and looked at old photos, including one of me as a baby. Owen and Jen thought that was funny. I’ve seen photos of me at around nine months old and I looked exactly like Owen did at that age, but at a few months old we looked nothing alike. Leaving Christiane’s we had a tour of Gonfreville, my Mum showing us the houses she’d lived in and her old primary school. We drove in convoy to Coutances, which was our overnight stop. Our hotel was on the edge of town, so we dropped our bags and walked into town, down a steep hill and then up the other side. It was hard work in the sun, especially pushing Owen’s pushchair, so our first priority in town was to get an ice cream! Suitably cooled down we had a wonder around town, Owen particularly liked the public gardens, with ponds, a playground and a maze. We also went to see my Mum’s secondary school before walking back down, then up the hill to the hotel. I haven’t been to Coutances for over twenty years, some bits of it seemed familiar, but I’m glad my Mum knew where we were going. We had a bit of downtime before all meeting for dinner. As is the French way, dinner seemed to last hours, so whilst Owen was well behaved to start with, he was getting grumpier and grumpier as the meal went on. Jen and I both had melon and parma ham to start, chicken tagine for main and apple tart for dessert. All the food was really good, Owen seemed to enjoy his too and seemed keener to try new things than he was in San Sebastian a few months ago. I didn’t manage to take any photos in Normandy, so the one at the top of the post is of Owen, whilst I was loading the car back in Coventry. This entry was posted in Roadtrips and tagged France, iPhone, Normandy, Owen, Photo by Lewis. Bookmark the permalink.